It’s hard for me to believe that Mark Alston and Del Vance opened The Bayou way back in late 2002. Since that time, it’s become the place for beer aficionados to congregate in SLC – not surprising given that there are some 300+ beers on tap and in bottles and cans on any given day at what has become lovingly known as “Beervana.” The Bayou has won countless awards for their beer selection, and rightly so. However, I think the bar (the sign in front says The Bayou is a bar, not a restaurant – meaning you must be 21 or over to enter) is underrated as an eatery. You might come for the beer, but you’ll stay for the food. And why not? Because not only is the cuisine first-rate, but the prices haven’t moved since I wrote about The Bayou in 2003. Literally. A bowl of gumbo was $6.99 then and it’s $6.99 now. Ahi tuna tacos with chipotle pepper sauce were priced at $14.99 in 2003 and that’s the price today. OK, I’m wrong: the crawfish etouffee went up four cents, from $12.95 in ‘03 to $12.99 currently. You get the idea. Not only have prices remained constant for a remarkable fifteen years, but the portions aren’t skimpy, either. You get a serious bang for your food buck at The Bayou. 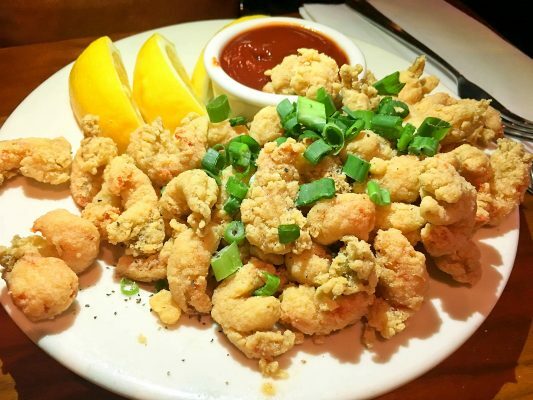 To wit, an appetizer of “popcorn” crawfish – tasty, tender crawfish morsels lightly floured and deep-fried – is priced at $7.99. It’s a portion size that’s big enough to serve as an entree, and I couldn’t even buy crawfish and cook the dish myself for eight bucks. The popcorn crawfish is served with fresh lemon wedges, a smoky-tasting chipotle dipping sauce, and topped with scallion slices. 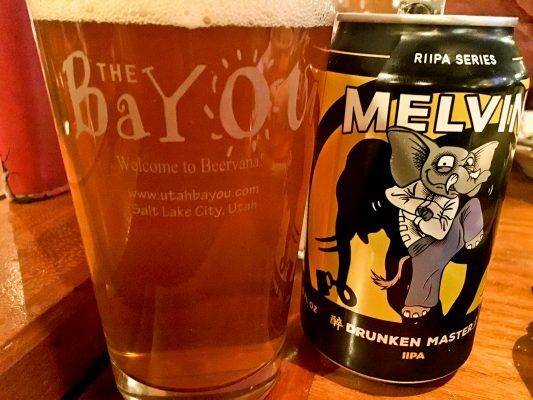 In the market for a fresh, crisp brew to accompany the popcorn crawfish, I settled on a can of Melvin “Drunken Master” IPA that our server recommended, just one of well over 100 IPA-style beers to choose from at The Bayou. Imagine that: an IPA lover like me could try a couple of IPAs every week for an entire year and not get through them all! Incidentally, beer lovers might be interested in the Bayou beer app that Mark Alston designed. It’s an interactive application that allows users to navigate around and learn about all of the brews served at The Bayou, available from Google Play and the Apple App Store. Perhaps the budget-friendly prices account for the big crowds. On a recent Friday night we stopped in for a pre-show dinner prior to seeing the great band Zepparella across the street at the State Room. The Bayou was mobbed, but we were seated after a short 10 to 15 minute wait. The staff is über-friendly, from the hostess to the bartenders and servers. Our server, Ross, was extremely helpful in steering me towards some interesting beers and, in the case of my wife, wine from a surprisingly robust wine selection, given that The Bayou is all about beer. I did also spot a handful of folks sipping martinis and cocktails, in addition to beer and wine. 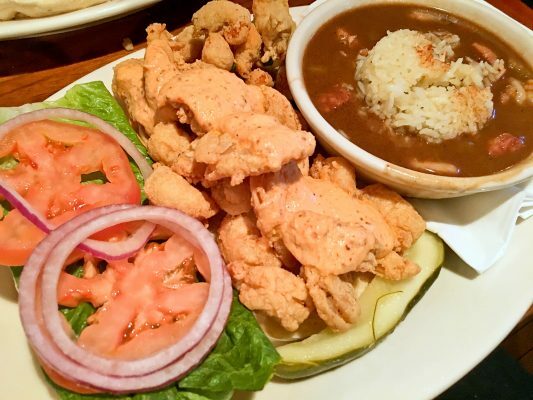 While The Bayou menu focuses on Louisiana/New Orleans fare like gumbo, jambalaya, etouffee, po’ boys, blackened catfish, muffalettas and the like, there’s also a lot of non-southern dishes to choose from. The extensive offerings include pizzas, burgers (including a Cajun veggie burger), salads, pasta dishes, entrees like roast pork tenderloin, desserts, and a lot more. There is truly something for everybody. Anyone who enjoys deep-fried turkey will go gaga over the Cajun game hens. It’s a brilliant idea: Cajun-spiced Cornish game hens that are deep-fried and served with steamed veggies and rosemary-spiked new potatoes. Another creative concoction is “Gumbolaya” – The Bayou’s popular jambalaya smothered with gumbo, as it says on the menu, “to ensure full cardiac arrest.” And, I know of no other venue in Utah where I can get Hoppin John: Cajun-seasoned ham, andouille sausage, onion, celery and green pepper simmered with black-eyed peas and rice. I’m picky about po’ boys, the quintessential sandwich of New Orleans. The biggest problem I have with po’ boy sandwiches is that folks try to fancy them up too much. A great po’ boy really shows off its main ingredient, whether it be roast beef, fried shrimp, oysters, catfish or whatever. The Bayou gets it right. Their po’ boy sandwich (choice of catfish, crawfish or shrimp) is legit. I opted for the cornmeal-crusted shrimp – a whopping pile of fried shrimp on a toasted hoagie-style bun with lettuce, tomato, onion and a light dressing of po’ boy sauce, similar to remoulade. It’s a sandwich you’ll probably have to eat with a fork and knife and my only complaint – a very minor one – is that I’d have preferred crispy, shredded iceberg lettuce on my po’ boy as opposed to the more upscale leafy greens laid on at The Bayou. For an upgrade of $1.49, I added a cup of gumbo to my po’ boy and was elated at how goddamn good that gumbo was. I think it would satisfy even the pickiest New Orleanian. My wife was happily surprised to find that The Bayou offers gluten-free buns for, in her case, the blackened catfish sandwich ($11.99). In Louisiana, “blackened” does not mean “burned,” and The Bayou cooks get it right: the generously-sized catfish fillet is very lightly blackened with Cajun-Creole spices and serve on a bun with a choice of sides (fries, caramelized shallot mashed potatoes or mixed green salad). 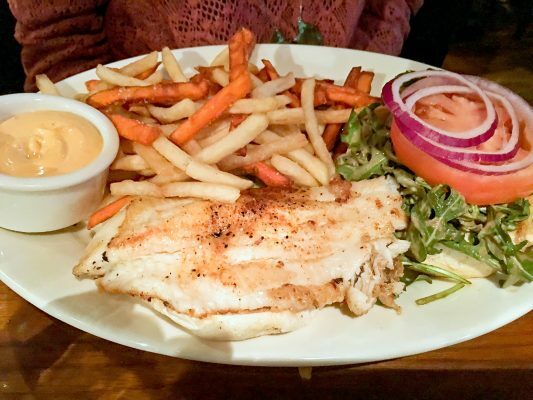 She opted for the mixed sweet potato and regular fries, which were thin, crispy and excellent. Call me crazy, but I really enjoy being around nice people. The folks at both The Bayou and The State Room – where we went after dinner – are the perfect mix of friendly and professional. I love The State Room not just for the excellent music that you find there, but for the super-amiable and outgoing bartenders and other staff members. For a very nice night out on the town, I highly recommend dinner and a show at The Bayou and The State Room.